For Indonesia, a country who has more than 250 million population, the internet has helped the public to gain more information for their business. Even for farmers, which is one of the main commodities in the country. Indonesian farmers are scattered through rural areas, located in more than 1000 islands spread throughout the country. Having a good guidance will definitely improved their quality of life. That is why Karsa becomes a breakthrough in Indonesian farming sector. 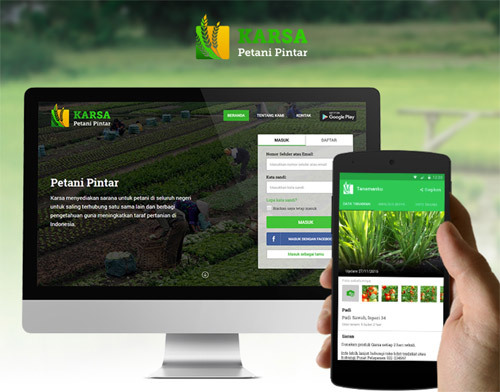 Karsa is an Android app dedicated for Indonesian farmers. It connects farmers with the suppliers, producers, consumers, and the government. Considering many farmers located in rural areas, it might be a bit difficult for them to gain useful information from the government and to distribute their crops. Therefore, a mobile app like Karsa is convenience to meet their needs. WGS developed the app and it was launched this early September and already got good impression from Tempo, an Indonesian national media and IT blogs like DailySocial. With GPS track, farmers can predict the weather based on their field location. This will help them to anticipate drought season or wet season. Usually the farmers will plant the crops according to the season for optimum harvest. Based on the planting time and type of crops, the app will predict the harvest time. Therefore the farmers can make the farm plans and control the crops distribution to the suppliers. Farmers can connect with the agricultural materials supplier to arrange which materials they need. This include the arrangement for pest control and other fertilizers. Agriculture specialists (from the government bodies or NGO) can also give more information about disease control and how to avoid them. The government can also contribute in this app to give more information to the farmers, or national announcement for specific case. This includes the national market price, crops distribution, or any details that will be needed. This will stabilized the market price and avoid illegal wholesaler for national crops. Karsa mobile app was built to digitalized agricultural industry in Indonesia, considering high mobile user in the country and to level up the smart farming system. Hopefully, more app like this will help Indonesia to get connected in every important aspects in the community.